In 2015 Joy Jarvits, who lives near Chapel Hill, called fellow quilter Jean Biddix Buchanan about a project she began in 2001 to collect a quilt block from all 100 counties of North Carolina. 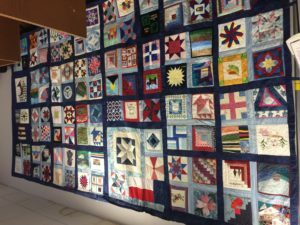 The blocks would be used to make a quilt celebrating the opening of the Women’s and Children’s Hospitals in Chapel Hill, NC. 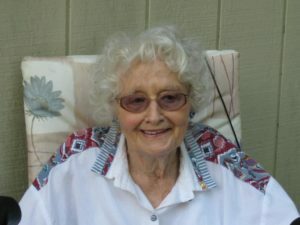 Jean had been the president of the Mountain Glory Quilt Guild in McDowell County. As Joy already had a McDowell County block, Jean suggested a block for Mitchell County. Buchanan and her husband Phillip were both born in Mitchell County and graduated from Harris High School. Phillip’s mother Ruby Buchanan died in 2012 and left several incomplete projects. A “Tree of Life” block that “Granny Ruby” pieced was the beginning of the block for the NC 100 County quilt. Jean hand quilted the block and embroidered Mitchell County in the corner. Ruby was born in Little Switzerland, NC in 1922, graduated from Harris High and married Phillip Buchanan, Sr. on Valentine’s Day 1942. She was the mother of two children, Phillip Jr. and Nancy Jane Tipton. Ruby was a member of the Beaver Creek Home Extension Club and a quilting group that met for several years each Thursday at Pine Branch Baptist Church. She taught quilting for Mayland Community College Continuing Education. Nine of Ruby’s beautiful quilts were displayed at Ruby’s funeral in June 2012, and each grandchild and many other family members have quilts made by Ruby. The NC 100 County Quilt with the Mitchell County Tree of Life block was on display at the library in Marion in September 2018, but it will be in Mitchell County, in the Historic Courthouse in Bakersville, by the second weekend in October. The quilt is approximately 16 feet wide and 8 ½ feet high. 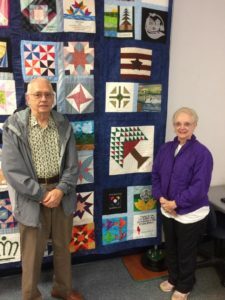 The Mitchell County Historical Society thanks Phillip and Jean Buchanan for making the arrangements to display the 100 County Quilt in Mitchell County. In addition, they gave MCHS a Christmas quilt that was pieced and hand quilted by the Pine Branch Baptist Church quilting group; the quilt hangs in the MCHS Museum in Bakersville.